One of the most popular gadgets this year seems to be tablets, with manufacturers launching new models on an almost daily basis, the latest company to unveil a tablet computer is MSI. MSI has shown off the WindPad 100, which comes with a 10 inch display and is powered by a 1.66GHz Intel Atom Z530 processor, has 2GB of RAM and a 32GB solid state drive (SSD). 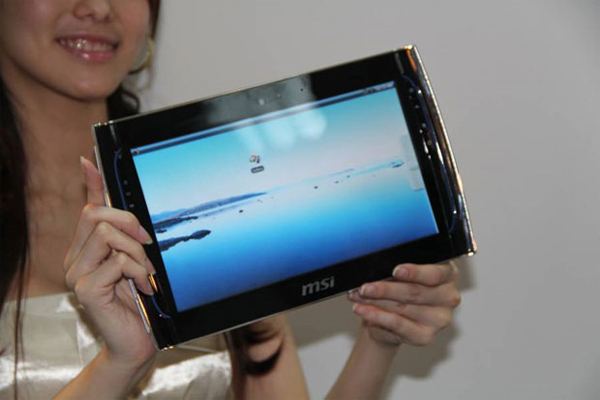 The MSI WinPad 100 comes with Microsoft Windows 7 Home Premium, and it features a custom user interface that MSI called the Wind Touch UI. There are also two USB ports, HDMI out, a web camera. MSI have said the the WindPad 100 will go on sale later this year and will retail for around $500.